I left at about half past 2, just after the item where a member of the audience asked for something blue and white in a north-facing garden patch in Cornwall on GQT (BBC Radio 4). The weather looked deceptively tempting; certainly better for a cycle ride than staying indoors. So on goes the long-sleeve base layer, a cycling t-shirt and a summer long sleeve cycling top. I knew hat I would be out late, even expecting to come back when it's already dark. Therefore I've taken my splash-proof cycling jacket and packed it tight on top of the rackbag. And yes, it was certainly colder than I expected. Summer knee-covering shorts with very long socks - effectively no leg skin showing - I thought to myself that in the long of the ride, I will get sufficiently warn that I won't feel the cold in the legs. No, not in the legs, but at the side of my thighs, every time a gust of wind showed that it was actually windy. Evidently, when riding through town one would not get much of this, and until you get to Watery Lane towards Battlesbridge, there is a long stretch of "town": first Southend, then Rayleigh. I had my knee support on also, as always; and whilst their purpose was to support the knee in stabilising its direction of movement, they also keep the knees warm. The afternoon kept sunny without any clouds, thus really makeing me feel the cold, whenever I just coasted along. There wasn't much of this though. As I realised that the cold would creep in, I just adjusted the gears to keep my pedalling comfortably. Up to the Turnpike, and I decided to go along the cycle route crossing each car lane to get to the turn up to Rettendon, but there I then chose to use the road, rather than the already very delapidated cycle path. At the top, just leaving at the other end I saw the rest (presuming there were more out to 11ses) of the SEG's on their way home. In order, but streched over a couple of 100 yards: Martin Fuller, Jon Collins, Chris Spicer, Lynda Collins just being overtaken by Ian Mather and a bit behind, I thought the old man would wind up the lot. But just as I decended to Rettendon Common there was Martin Pipe struggling up the hill. I greeted them all, and they must have wondered seeing a strange face out on the road. I took the turn for East Hanningfield, and though I did this just recently in the dark, it was quite interesting to see how much different, or longer, it looked than just on the map. Second exit at the RAB led to Bickenacre and I took Moor Hall Lane to cut short towards Danbury. The last time I rode on this strech I recalled was in the opposite direction (and about 8 years ago) with a lot of folk who are now retired from cycling due to age and other such related ailments. Getting up to Danbury I did not remember to be such a long strech of up and more up. Anyway, I took the wrong turn, which in fact was the turn I knew at the point where the road started, but at the time I thought it would end up in a different location. So I turned right at the RAB to go a bit more up and then down and up again to reach the turn for North Hill. There I then decided that I finally would have to put on my warm-keeping cycling jacket, lest I'd be a cycling icicle at the bottom. Now, lucky there were no speed cameras on the way down. Well, at least I did not see any signs for any. Dare-devil approach means hands tight on handlebar, but no intention to use brakes: 57.7km/h (35.85mph). Any hairy moments? No, none. At Papermill Lock cars are parked in such a way that on-coming traffic is on my side of the road - they don't slow down, so why should I? I went left at the TJ towards Terling, but then used an unmarked road (left again) through Hogwells to hit the B1137. Left and after half a mile right to Little Waltham via Russel Green, followed by Chignall Smealy and down to Chelmsford. When in Little Waltham an overcast was building up, I could pretty quickly feel that I also got warmer whilst cycling along. But as soon as I was back in Chelmsford a cold gust told me that I am in for headwind all the way home. There I took the NCR1 along the river until I got to the Army and Navy RAB. So, I should get off the bike and push it through the underpass to get out towards Gt Baddow? No way. For me there was no question, for others it might have been an issue of confidence. But the way that this RAB is laid out now, I had no trouble getting round and out on Baddow Road. I have no idea what those planning guys are thinking, but as a person I have the same attitude, whether I go by car or by bike: there is a road through town, I use it. I am not going to massively prepare hours beforehand what the best (based on what criteria?) way is to get through, e.g. if and where are there cycling routes. I happen to be aware that there are some, as I have been told by our Chelmsford-based CTC members, but I don't care, when I just want to cross another town on my route. So, through Gt Baddow, and just crossed Essex Yeomanry Way (the road coming from the Army and Navy RAB to the A12 Tfl), and deciding, whether I should use that way via Howe Green and the old A130 back home, or ... yes, it's more interesting via Sandon, Butts Green and back through East Hanningfield. I dithered, but then quickly ditched the idea to do the Creephedge loop via Tropical Wings to the Turnpike. I took again the road rather than the cycle path down to the Turnpike. Luckily, at this time on a Sunday afternoon there are less cars around. I like going on the road, because it leads to a nice judging game, when sometimes cars waiting to get onto the round about see the sudden unexpectyed accelaration - taking in the speed from coming down the hill - of a cyclist just after a car has passed the turn. Whilst my aim is to cut over to the second RAB along, most cars turn the second exit to use the new road towards South Woodham Ferrers. Anyone who aims to go on the new A130 after the second RAB will have to accelerate first to catch me up. Due to the direction that I take I am as close to the centre of the first RAB, whilst aiming for the outside on the joining road and then immediately for the exit to Battlesbridge. So far I have yet to see a car overtaking me during this manouvre. Crazy? - Thrilling! ... Other folk spend lots of money to get drunk and/or all sorts of palpitations. So, back through Watery Lane, and quite evidently car drivers' attitude to cyclists is worse than north of the river Crouch. I am not so worried about the speed of over taking, as long as you give me the distance. Basically allow for a swerve, if need be - I am not obliged to cycle in the gutter or go through potholes. IMO, the average car driver has not got sufficient an understanding of the size of their car to judge how close they are to the curb. If you observe the car in front, they will hardly ever go closer than 1.5 ft to the curb, but they have no problem overtaking a cyclist at less than half a foot. Crownhill, and my lowest chainring would not go in; next Bridge Water Drive, same here. I had a nice dash along the Chase and final hill - normally not an issue, but then I felt it as such - up from Fairfax Drive to East Street crossing. I like shooting around the corner showing car drivers that I am just as impatient as they are, when I can accelerate faster round a corner than they can (law of physics: I can lay into the bend AND accelerate - a car can only accelerate once they leave the bend). So I drifted off to the left onto the cycle path and slowed down immediately, 'cause I was knackered. I took every turn of he pedal in its stride, joined the road again at he top, because after crossing the Tfl there is a narrow joining cycle path just after the bus stop off the main road onto the parallel shared pedestrian/cycle path. There was a stretch of actual cycle path along the Civic Centre, but where this changed back to sharing with pedestrans I joined the road again. Left at the Tfl and then indicating to turn right down Chichester Road. There is a large cycle-waiting-box at the Tfl, but no real way how cyclists would get there other than wiggling through the waiting cars. Sometimes you wonder where people are looking - I indicated to go into Whitegae Road and paid close attention to the folk and whether they would see me, but the oncoming pedestrians with their buggy were walking straight into the road. Any faster and a collision would have been inevitable. On the last couple of miles I felt my saddle moving... or so I thought, where I put it down to a subconcious illusion, as the one most painful part of my body was a spot on the left cheek of my back side. (It reminded me of the French Ride - PBP 2007: pain in the backside, just this spot, pain in the lumber, pain in the neck and my knees were doing their own thing.) I got off the bike at home and truly, the saddle was moving. Out with the tools and fixed, and as I was at it, I re-adjusted my handlebar as well. It had moved down a fraction, when I had to do an emergency break and I was leaning into it. Feeling pretty exhausted I afforded myself a hot bath, lit some candles, as I didn't like the bright ceiling lights and had one and a half hour of relaxation in the bath. Final stats: I had a brief look at the watch immediately when I got home: 19:17. This makes it about 4 3/4 hours; OK, perhaps 5, but the speedometer tells me: Dst: 96.793km, Max: 57.7kmph, Avg: 20.6kmph, Time: 4:42:48 (effective cycling time - without stops); and I hadn't stopped anywhere for long: putting my jacket on took about two mins. The stats are in kmph, because I ride/train under the rules of Audax (long-distance cycling organisation). So, I can't complain with 60.14 miles in 4:42 at an average of 12.8mph, since I would not call myself really fit. ... nearly 20 days gone - need to recall quickly, b4 I forget. I needed a week to 'calm down'; but also to recall the most exciting bits to the people I met. I got a lift home, of which the opportunity I happily took - mainly, as at the time my knees were killing me. I would have been prepared to stay a day longer or two to calm down there and to appreciate the 'holiday' atmosphere. But I probably would have needed 2 days to Beauvais and then take the train from there. Recalling backwards: I got my book signed at 16:36; with a starting time of 23:10 on Monday that meant a total time of 89:26. Slow, yes, but within the time - interestingly, though they gave me another 13 minutes, so that my certificate states 89:13 for total time. Arriving at the gym was as much a relief to have finished as it was non-exciting, or better to say not very exciting. Although I don't quite know what I should have expected, coz as I was there (at the event) pretty much on my own and coming in unaccompanied, there were the people still clapping and appreciating the effort. 2 hours before and 30km ago I texted Chris that I would be coming in by 17:00, just in time. That stretch after the open plain leaving Dreux through the 'residential' suburban areas were much agony, as for the little bit of hills my knees were screaming. I don't like the sunshine, so was anticipating any moment that my 'hot foot'-syndrom kicks in lowering the pace even more. Looking up I could see the hills around the city telling myself after this next 'slope' a valley with buildings indicating the closer range to the finish should be appearing. Concentrating on the balance between pain and not loosing the way - looking for arrows and other cyclists to overtake or 'compete' with I didn't quite realise when I caught up with a bunch who left earlier, just about 15 mins, from the food stop. But that can make a difference. I considered them also to be stronger in keeping a steady pace at any rate, when I 'suffered from the pain in knees, back (lumber area) and backside. But then the weather did a turn in my favour: I thought I felt a few spits. Probably just imagination, but the sky darkened and it became that little bit cooler that drew out some hidden reserves. I didn't know at the time - I still don't know how or why, but I suddenly felt surge in strength that kept me accellerating. I thought that there at the end there were rather few arrows - similar to the directions outside town: only at significant points. So at times I had to go slower to figure out that I am still on the correct route. Finally, I cought up with some more riders: confirmation of the right way. Coming closer to the finish looked like a complicated way round as having ridden the 2 days before in this area, I could have sworn that we did a couple of extra loops. So I arrived on my own to the clapping of some people still around. This must have been a real good party from Wed eve through yo Thursday. So I actually do appreciate that there are still some folk left. The next thing was to find a place where to leave the bike. Having a back pannier I wasn't happy with bike stands that steady the front or back wheel only on a secant of the wheel. About 10 mins later the people turned up who left Dreux before me and who I overtook, when the weather turned cooler. I gave an honest, but unnecessary explanation and we parted. I had a look around the different stalls of the participating departments and finally also found the foto-display stand. I chose to buy only one for €10. It's a nice reminder of the ride in the 'glory' of my outfit. When I got my bike to leave I met a few people who I met on the way and got chatting again, the aftermath: Recalling some similar experiences occurring at different times. Seeing the vintage cyclist with his two gears: the larger one pedalling forward and the slower one when pedalling backwards, thus having two sets of chainrings, chains and back sprockets. The different types of recumbents and their issues: fully covered going slowly up the hill, but with a big advantage going down and on the flat. The rowingbike-tandem, or the German triplet. And several accidents... 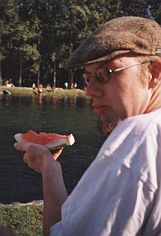 I got to know about Joel when others were talking at a food-stop that he had written a pretty good account from the last event in 2003. But now he kept a diary to get the happenings in order. The ones for which I have most respect are the fixed wheel cyclists. Mainly, coz I'd like to ride one myself, but I have been told that if you've got trouble with your knees that is a no-go area. Although understanding I still found it interesting to learn when a girl said that why stop to put on the shammy-cream for your backside, when you can do this whilst riding (on a fixed). - (Yes, I know, not a good sentence to loose in a rides report, but it's still part of my memory). We came to the conclusion that on the question "Why would you do this?" there is no answer to those who are standing on the outside. You have to have gone through it to understand. Perhaps there are areas in which to achieve that others can't understand - I think that's probably the way to explain. I relaxed a few more minutes with Chris & Val outside the gym. With the amount of people outside, or the few people outside I reckoned that the finishing event took place with all the prizes, etc. At that moment I wasn't too bothered (just the best word to express this circumstance) to go inside. Just a little later I regretted to not have seen the prize-giving ceremony, as it was probably the only time for me to be around here. When I was in the hall to get my finishing time set, there were tables and a stage already set out, for the honoraries. With my impression in Villaines I was a bit disappointed that there was quite a large bit of emphasis given to - I call it - pleasing the political surroundings (party for on-lookers with own beer tent, bbq, etc; television presentation and commenting on the working together with the different departments - from what I figured of the French), whilst the majority of 'unknown' riders worked their ways through the control point. Because of this setting I did not expect to see so much encouragement at the closing event either for all those who just came and did the event. There were obviously those well known riders that were supported with placards through the different departments. But they had all finished by the time that the slow end came in. I decided to cycle to France well before I got the last qualifier event through. Mainly, because it's the cheapest way and the most flexible, having my own transport with me and being able to stop where I liked. I started on Monday, 13th at 8:30 and at 10 past 9, I saw Mike (nutty) coming down from the Hadleigh roundabout, going to work. As before, it took me about 45mins to get to Vange, where I got confused with the RAB to Stanford-le-Hope. On the way to Tilbury I lost one of my backlights. I realised something dropping, but with all the rubbish on the road at first I thought it was just something I ran over. The crossing cost £2.70 at about 11:05; I just got on board b4 the ferry left for Gravesend. I found the A226 easier than when I looked it up on the map before. With some kind of dread I was looking forward to the Chatham hill, which Buster was referring to as being 'a hard one'. Although I didn't perceive it quite as gruelling as I imagined it was rather more a long drag. Along the A2 through Sittingbourne and in other places there was a "nice" cyclepath going up and down like the sea next to the road, interrupting the (cycle-)route on every junction with priority to the metal-boxes on wheels ... I stayed on the road, upon which some car drivers needed to make a point that they didn't like that. I got the 18:50 ferry to Calais. Instead of the £18 for P&O, I enquired a £12.- ticket through SeaFrance. They didn't want to see my passport, neither at the control, nor at the check-in booth (!) - I know how to leave the country, in case I needed to go urgenly ;-). After I found the camp site, which was full, - but really easy to get there - the warden was 'back in 5 mins'. I got some food, which was rather difficult, as shops close at 18:00 or so. When I came back the office was closed, so I pitched my tent on an empty spot and stayed the night anyway (for free). I managed to sleep a bit with all the holiday folk around enjoying the evening. I left Calais at about 9:15 for Rue. Leaving the campsite I promptly took the wrong turning into the road, where luckily no cars were coming. The drag up to Cape Blanc Nez definitely rivalled Chatham Hill, bit worse as it was all open plain field. Cyclist's greatest 'f(r)iend' the headwind accompanied me throughout my journey to Paris. This way I got just about 110km in on average per day. There are loads of cycle paths on the way after Boulogne, but else car drivers take really care when overtaking. I actually did not even feel threatened by cars overtaking close, as this is usually my near-side, where I wouldn't expect any dangers other than self-created, e.g. cycling too close o the verge. I had my probs to get out at the other end of this town and did a stretch on the N1 before continuing on the D940. Towards the evening I got to Rue, food in a supermarche and found a Lidl / Aldi afterwards - still looking for a backlight and possibly a rainjacket, but their offers are different from what the stores in England provide. The campsite 'Camping des Oiseaux' was just after Becquerel. £8.45 for the night - shower, dinner & horizontal. Late off at 9:00. Saw some 'hairy beasts' (=Aberdeen Angus) just b4 the RAB at Noyelles. Nice reminder of Scotland. Less hills around here, though. There's a good cycle path parallel just underneath the road level protected from the wind. From St. Valery I cut to Gamaches on the D48. Without the headwind the miles (kilometers) seemed to fly passed. In Gamaches I had a foot-long granary tuna sandwich, with all 'mod cons' in a deal with a drink. Continuing on the D1015 I made reasonably good progress. After Senarpont there is a good up-hill drag (perhaps 8%, like Bread&Cheese hill in Benfleet, half way up) for about 1 mile. Just before the top there is a little chapel. And all around there are pieces of clothing hanging on the trees. Like someone has thrown bags destined for charity into the bushes & trees. With socks, trousers, skirts, t-shirts, jumpers hanging all on top of some more clothing. Looks really spooky, but somehow deliberate. I tried to take a pic, but my camera has over-exposure probs, so these won't show well. After 'le Coq Gaulois' (spelled with a lower case 'L'), a pub with a couple of houses around the road changes to D315. There are a few annoying stretches, when the road turns into a dual-carriage way for cars without warning nor signage for cyclists, where to go. So I had a few route-elongations, notably one already just before Rue via Here and Flandre; another one was after Grandeville on the D901 via Gaudechart. And a more inconvenient circumvention was almost via Beaupre - steep hill, then along the river - to Achy. As Buster suggested the hills as marked on the map were not that much of a challenge. I came across a pair of mountain bikers, better to say they crossed my way. But they were very helpful & could speak English: Martin & Eva lead me to the Camping Municipal. Martin explained that the cathedral of Beauvais apparently is the tallest gothic cathedral on the planet. €5.70, which made me stay for two nights, as staying in Paris would have come more expensive. Also, communicating with 'hand & feet' the warden there explained where there was a bike shop opening at 10:00. 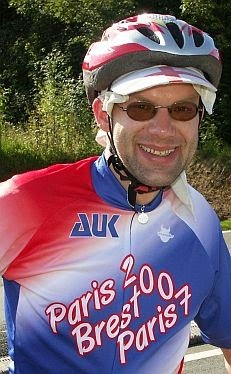 Putting on my AudaxUK - PBP-shirt, so folk know what the deal is about - yes vanity, vanity (!) -, I found ... a Decathlon and all the bits that I needed for the big ride, a backlight and a proper headlight. No, I decided that I use the rain-jacket that I had with me, but I got a long-sleeve summer jacket, which I had on throughout 'the' ride. I got lost on the way back, but a runner showed me our position on the map. Cycling without the luggage is definitely quicker/easier. I got some postcards and stamps and committed my duty for being on hols and telling people how well I am. I consulted the tourist office re some aspects of the town. And there I knew, I had to come back here afterwards to ask this woman out. I met a gentleman at the campsite who explained that he is with friends, in total 8 cyclists here, but also has to leave the next day to end their holidays. He spoke pretty good English and like many amateur cyclists was aware of the PBP and its challenge. I left the next day at 8:25, and as always, since I 'ditched' the socks in Calais, now (and for the rest of the journey) cycling bare-feet in sandals and the 3/4-shorts with the reflective stripes around my ancles. Just to say good-bye to the warden: he sat with a coat in his little office with the heating at full blast: it was fresh as it had rained the night before last, and the clouds were still moving, but not that cold. I took a residential route out of town to miss a hill on the main road and thus encountered a nice up-winding slope through the wheat fields. Following the D927 just after Auteuil I saw a group of cyclist - I counted 8 - working their way up the hill to cross the A16. I overtook them, but stopped where the faster ones settled to wait for the others. So we had a bit of a chat. I got my first photo taken with the PBP outfit, and I handed them an address card. What I regret most was that I didn't ask for their names. Again, I thought on the way back to Beauvais I might perhaps have been able to get their names from the warden (to Google, or so). But it was not to be, so I just remember a very friendly group of cyclists. In Rebassons-Abbaye I finally managed to post my postcards. A very interesting feature, if already 'commonly' known, but it really is like the cliche that in the morning one can see people chatting all with each 1 or 2 french-sticks in their hands. Coming straight still warm from the boulangerie; and it smells delicious. I Amblainville I got a 'brownie' for €1.20, to mention here, coz this chocolate cake was more like a dried version of a blackforest gateaux, just without the cream and the cherries, but with bits of chocolate chips, extremely rich and good size for money. Using all the tips that I got from Buster I tackled Pontoise, which was fine to get in, but taking a wrong turn I got lost on the way out. A detour of 5km to get back to from where I left and continued the D984, then D54 becoming D48 into the D392. This was a seemingly endless 2hour journey towards the centre. I should have taken the D908 which forks off from the D992 to the left. I didn't see the sign and got lost in 'la Defense', a similar one-way-system area as in parts of London. I asked myself through several communities twinned with towns in Germany towards the Pont de Neuilly, which I promptly missed and crossed at the Pont de Courbervoie. Considering the longish journey from Pontoise to the centre I shouldn't have been surprised that it took another hour to get from this bridge to the actual campsite "Bois de Boulogne" wedged between the river Seine and the D1. I found a Carrefour to get food for the evening. €18.70 for the night made me quickly look for a better solution. The next day I 'ventured through the town' in search of a library, coz they have maps where to find a particular campsite closer to Versailles, where the Start is. The library opens at 15:00 in the afternoon on a Saturday. So I 'just' had a closer look at the Arch de Triumph, where I was promptly asked to leave by the police, as one can't take the bike there - could lock it to the reillings around, though (?). The Trocadero offered a different view of the tower, so I positoned my bike conveniently there. And then I had a look at the Statue of Liberty crossing Pont de Grenelle (just in case the reader don't know where to find this miniature version of the lady trying to illuminate the citizens of New York). So, in the Carrefour at the Pont de Atueil I found a little map with a better scale to show me where I was going. And off I went to Versailles: the camping municipal was full, but they indicated a campsite with showers, but no electicity. I found the place and it turned out that it was mainly used by Italian campervans as a through-route-stop. At €6 per night & head (no matter what sleeping facility) it's a comparatively cheap option. A luxury treasure found here: so I cycled back to Paris, got my stuff, which I was allowed to leave at the reception and went back to this new campsite. There is a nice slope to climb after crossing the Seine on the D907. Continuing on the D985 and then on cyclepath along the D10 the entrance to the campsite is just opposite the south end of the shorter canal in the Versailles gardens. On arrival I met Tobit, a German, who found the campsite on the Internet, and his friend from California. It was interesting to constantly speak English, as usually when meeting Germans they tend to immediately start speaking German. Having a tent, but no groundsheet Tobit was happy to get lucky to find a place in a hotel with his friend. Getting the priorities right, he had an espresso-machine to heat over the gas stove strapped outside his panniers - an everyday 'essential', as much as a wet shave. I found a discount supermarche "Ed Saint Cyr L'Ecole" on the way to the gym, where the checkpoint and the start was going to be, and stocked up for two days. I had my check-in on Sunday in the morning at 9:30, which was an adventure for itself. When queuing with the English cyclists I met Stephen Poulton again and we recalled the closing events of the New Forest 1000, and his description of my expressions in his article in the Arrivee. I stood there for about 45 mins before I got to get my registration documents, or better to say, I didn't, coz they weren't there. Much run around and another 20 mins to wait - I had my print-out from the email, but the '3142' was not with the English lot as expected. It turned out that my registration pack was with the German lot. Relieved that I got my pack finally, I was rather angry upon this and considered to write a complaint ("a suggestion"): I live in England, I am registered only with an English cycling club, I belong only to AudaxUK, I did all my qualifiers in England, so I was expecting to go with my fellow English cycling colleagues. The only indication to being German was the 'Nationality' box on the registration form. And as I had not seen any communication suggesting that the registration would be according to nationality, I consider myself being allowed to be annoyed. As it happened a similar thing happened to a Frenchman, who was solely affiliated with a German setup (living there, registered club, qualifiers). I wonder what would happen to people with dual nationality (?). The bike check (front & rear lamps present, backup of lights and reflectors for the night) was deferrd to the start on Monday evening, when it would be dark anyway. Well, these notes above were finalised in March 2008, and I still like reading them and recalling the memories. Unfortunately, there won't be much of any additional experiences coming, as most is too far away... However, if I could (physically), I would do it again! ... down the line, and I still have not added the bulk of the comments that I wanted to make. I'm still trying, though. Was back quicker than I thought. Managed to get my own fundraising page set up for the PBP. 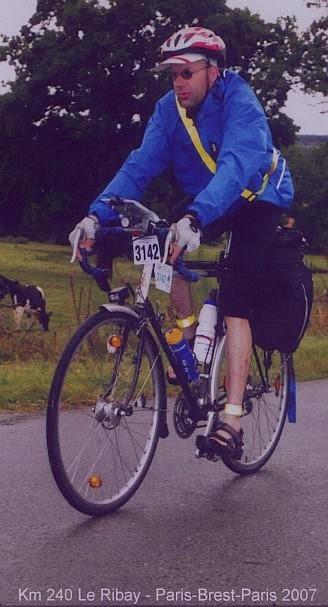 Have a look at the page (http://www.bmycharity.com/pbp2007se) and see whether the cause encourages you to sponsor me. Would be very appreciated. You can find info for the PBP2007 here. I shall come back when there's a bit more to tell.